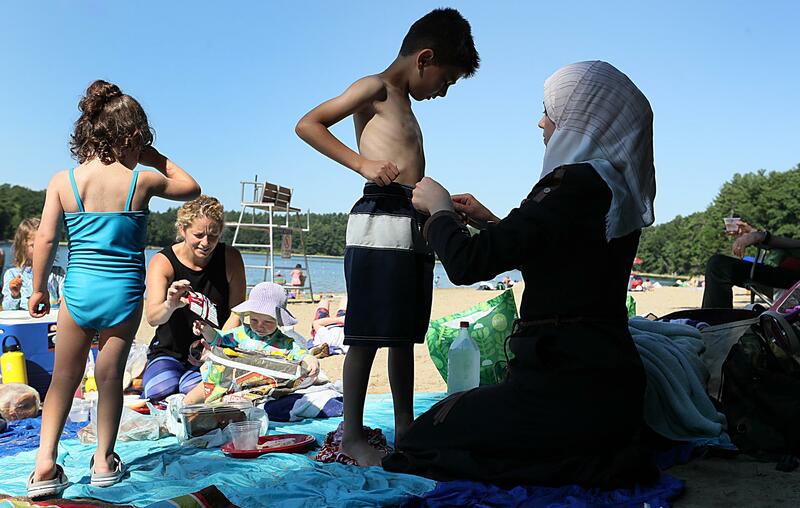 At Asmaa Hayani’s first trip to an American beach, she helped her son Ali with his bathing suit. Third in a series of occasional articles on the Syrian families resettling here, and the local people assisting them. Through other eyes, it was a summer paradise that lay ahead, glittering in the morning sun: a curve of golden sand where people in bathing suits sprawled beneath a flawless sky, kicking off sandals, anointing themselves with sunblock, wading into the cool, rippling water. But the Syrian woman, Asmaa Hayani, covered in a headscarf and long, tailored coat, gazed out at the view and tried to cast away her dread. “Isn’t it pretty?” asked the easygoing, blue-eyed woman who had organized this outing and driven Asmaa and her family here to Walden Pond. Jessica Lasser, 38, was one of a small, close-knit team of volunteers and resettlement caseworkers that looked after this young refugee family. For seven months now, it had been their responsibility to ease the family into a country and a culture where virtually nothing was familiar. They had settled the Hayanis — 27-year-old Asmaa, her sweet-natured 29-year-old husband, Abdulkader, and their four young children — in a little house in suburban Framingham that they had scrubbed and furnished. They drove the family to doctor’s appointments, escorted Abdulkader to job interviews, and helped to enroll the two oldest children in school. One frigid day during the winter, when Jessica took the family sledding and they marveled at the cold, she promised the Hayanis a trip to the beach when summer came. The children counted the days. Abdulkader, too, was game. But Jessica worried about Asmaa. Asmaa had been wary of going out in public almost from that first rainy night in January when the team from the resettlement agency, Jewish Family Service of Metrowest, met the family at the airport under the shadow of a looming presidential travel ban. In her first few days in America, Asmaa and her family felt like strangers in a strange land. 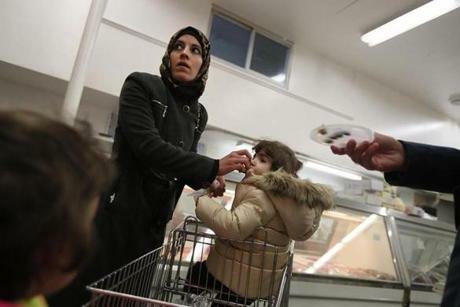 A volunteer had taken her to shop for the first time at a halal market. In this alien world, Asmaa felt conspicuous, especially when wearing the clothes that covered her body according to her faith. She was paralyzed by the possibility she would encounter someone who hated her because of it. The volunteers had tried to make her feel safe. They went to the house to keep her company when Abdulkader was away at night English classes, when the dark seemed to deepen her discomfort. Asmaa eventually told them she would be OK without the visits, that she would rein in her fears on her own. But the problem didn’t go away. Jessica had seen Asmaa’s delicate face cloud with panic, just at finding herself in a crowd of people. The volunteers told her the anxieties weren’t uncommon or unreasonable; her family had been forced from a country eviscerated by war, after all, places they loved bombed to rubble, friends and loved ones killed. Asmaa explained to them that she had always had a fearful nature. When she landed someplace new, it could overwhelm her. What she feared most was to be unwanted. Worried, but trying to project a cheerful calm, Jessica kept an eye on Asmaa as they crossed the parking lot toward the pond, toting their children, a cooler, stroller, and bags stuffed with towels. She’d gotten them there early to beat the throngs, but groups of beachgoers were steadily arriving. As the boys ran ahead, Jessica directed them past the busiest stretch of sand to a protected nook, backed up to a steep embankment, that would give Asmaa some shade and privacy. There, they spread two blankets side by side under a canopy of leaves, one for Jessica’s family and the other for the Hayanis. At first, Asmaa stayed anchored there, but eventually, as the sun rose higher, she ventured from their refuge and walked toward the children as they laughed and splashed in the shallow water. Jessica watched, pulse quickening. Asmaa hitched up her long coat, took off her shoes, and stepped in, wavelets lapping the tops of her feet. 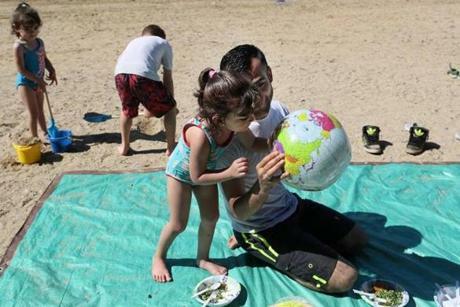 At Walden Pond, Abdulkader held up a beach ball with a map of the world. He showed his daughter Fatimah where Syria was, and told her to kiss it. The tension they all felt seemed to dissipate after that. They lounged on the blankets, eating the tabbouleh salad, stuffed grape leaves and kibbeh meat cakes that Asmaa had made and packed in grocery bags, and the bagels and zucchini bread Jessica had brought. Leaning back on the blanket, Abdulkader spun an inflatable beach ball, a map of the world on its surface, and planted a kiss on the tiny shape of Syria. When one of the girls needed to go to the bathroom, Abdulkader and Asmaa walked her there together. A time later, when her other daughter tugged at her, Asmaa took her hand and repeated the trip on her own. Asmaa’s gait looked freer, it seemed to Jessica, her steps lighter, even as her coat swung around her ankles. Exhilaration surged in Jessica. Asmaa had braved the beach. It was a turning point. Asmaa was happy, too. The glow of it stayed with her on the drive home, and later that evening, while she and Abdulkader hosted another newly arrived Syrian family for dinner at their home, Asmaa offering them advice and comfort. 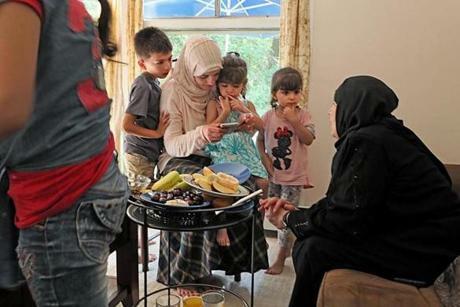 After her successful day at Walden Pond, Asmaa and Abdulkader hosted another newly arrived Syrian family for dinner at their home, Asmaa offering knowing advice and comfort. Ali, Ameeneh, Fatimah, and their mother, Asmaa, looked at photos of the new Syrian mother’s older children who could not get visas to America. Four days later, though, Asmaa fell ill, and a volunteer took her to the emergency room. It was crowded and chaotic, and as they sat waiting, Asmaa could feel someone staring at her. A man nearby was glaring, his gaze steady and unfriendly. Every time she looked up, his eyes were fixed on her. Then he got up and came walking toward her. He addressed her angrily and loudly. Children are not allowed in the waiting room, was what he said. But he did not scold the other people who had children with them. Only her, a mother wearing a hijab. This was what she had feared all along, what she had braced for. The day at the beach had been a dream. Now she was awake, and her fear had a voice, and a face. She couldn’t shake it from her mind, even when she was safely back at home. Even after days had passed, she still felt threatened. Would the man come find her? Would he try to hurt her? One day, she thought she heard knocking at the windows. Certain it was him, she called Abdulkader, and later told her caseworker at Jewish Family Service. All offered comfort, but the worry stayed. Nothing could dislodge her feeling that, despite their sunny, spotless home and all the kind people who helped them, she was stuck in a place that might not want her. And she was so very far from home. Abdulkader’s memories came in fragments, bright flashes from a dimming past. The village of small stone houses where they came from. Asmaa’s father tending his pistachio trees on a shared plot of land. The family weddings where Abdulkader danced the dabke, kicking and stomping side by side with his brothers, a tradition as deep as any he knew. Often when he slept, Abdulkader dreamed of home. One night he saw himself on a balcony. As he stood there in the open, someone started shooting. In another dream he was on the road to his old house. Elation swept through him at each familiar landmark, until he turned a corner and saw the Syrian army. Stricken with terror, he turned and ran away. Even in his dreams, he could not go home. He tried not to dwell on the things he had lost. He willed himself into the present, for the sake of his family, their future. The only way forward was to make a life here. Temple Beth Elohim members mingled with the Syrian families at a party at a temple member’s home. Barbara Shapiro, one of the Jewish volunteers, picked up the youngest of the Syrian refugees. The volunteers from Temple Beth Elohim in Wellesley came to the house almost daily, drinking tea, reading with the children, driving them all to appointments and errands and playgrounds. 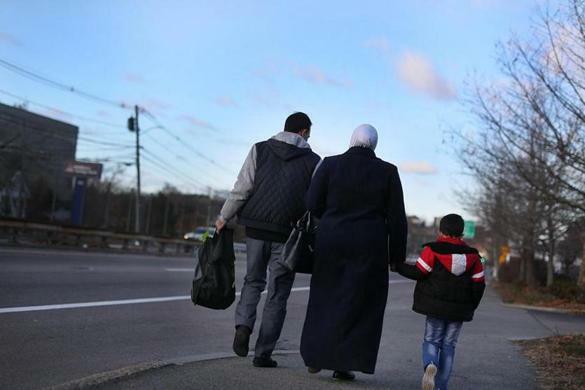 The Hayanis socialized with a half-dozen other Syrian families who had been resettled in Framingham at the same time, and attended English classes several times each week. Abdulkader rode his bike to the full-time job his caseworkers had helped him find, as a tailor at the menswear store Jos. A. Bank. In Syria, he’d had his own shop, with six employees, after leaving school at age 9 and laboring for a dozen years. Still, he’d been elated to find steady work in America, in the trade he’d practiced and perfected all his life. His employers were just as pleased with him, his skill and precision and eagerness. On his days off, he pedaled to a small family-owned fur shop not far from the house, where he refashioned vintage coats beside an older Greek tailor as a crackly radio played 1980s ballads. The second job provided a little more much-needed money — his constant worry — and it was teaching him new skills, fueling his dream of one day owning his own shop again. Abdulkader quickly took on a second job, turning old fur coats into linings for raincoats. He finished his first fur coat in the summer for customer Ellen Cohen Kaplan at Forever Fur. But it was becoming apparent to him that there were obstacles he had not foreseen. Abdulkader was a devout, conservative Muslim, whose religious practice forbade him to touch women he wasn’t related to. In Syria, it had not been a problem; men and women went to separate tailors. Here, it was different. Men and women routinely shook hands; male tailors measured female clients. How could he run a business if he could not do those things? He tried not to despair, but he worried that he would have to find a new career. At home, he and Asmaa exulted in the children, who seemed to thrive. The boys, Mustafa and Ali, 9 and 7, twirled fidget spinners, sang along to Justin Bieber, and played soccer in the backyard with other neighborhood kids in a noisy, happy pack that reminded them all of life in Aleppo. The boys already could speak and read English and were getting better by the day. It made Abdulkader gleeful — they would be doctors and engineers — but it also tugged at a thread of unease. He and Asmaa were much slower to learn the language, even with dedicated practice and YouTube tutorials. He did not want to lose his children in that gap, and he did not want them to forget the place they came from. 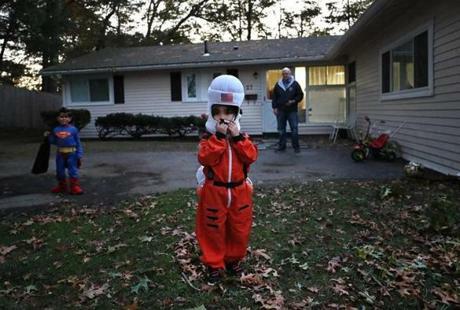 The Syrian children, escorted and instructed by the Jewish volunteers, celebrated their first Halloween. American flag on her helmet, Fatimah Hayani dressed as an astronaut. In July, Abdulkader was sitting in an English class when his teacher extended an unexpected invitation. Her friend Joanie Block ran a local professional dance company, and she was planning a special show, Muslims and Jews dancing onstage together. 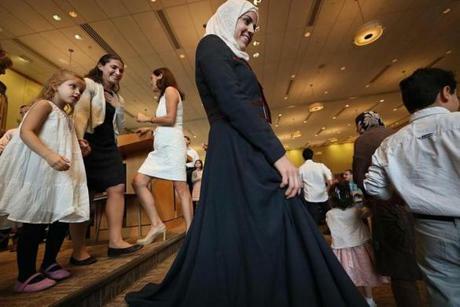 She wanted Abdulkader and the other Syrian men to perform the dabke. Curious and excited, the Syrian men in the class all began talking at once, arguing about what music they should dance to. Abdulkader felt a rush of emotion: This would be his reason to teach his sons the dance, to pass on the tradition his brothers had handed down to him. When he had time between work and English lessons, Abdulkader sat at his sewing machine in the playroom, carefully cutting and stitching swaths of fabric, making traditional Syrian costumes for the boys: the wide-legged sirwal trousers dabke dancers wore, with matching tunics and snug wraps to go around their waists. The night he finished, he was so excited he went to their room and shook the boys from sleep to show them. One day shortly after, he summoned them and told them it was time; he would teach them the joyful dabke steps. But his feet felt rooted to the floor. Abdulkader had not danced in seven years, since before the war, before everyone he’d known then had been killed or scattered around the world. The dance was so entangled now with grief and loss. 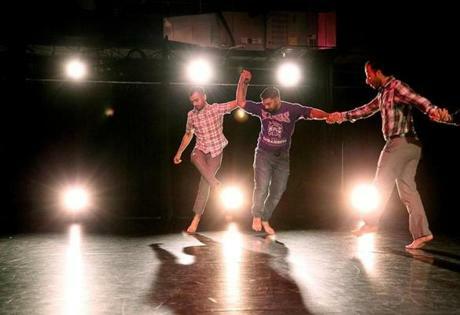 Abdulkader was joined in rehearsal for the collaborative dance by Jews and Muslims by fellow Syrian refugees Mahmoud Aljasem and Ahmad Aljelou. He turned to YouTube again, and called up a video of dabke dancers. The quick pulsing beat of the music filled the room, and all at once the boys were dancing, or trying to, laughing and tripping and spinning without yet knowing how. Abdulkader stood to join them and willed his feet to move. Asmaa reached for the bottle of laundry soap. It was empty. It had been two months since the terrible day in the hospital waiting room. She’d made a fortress of her home since then; if she needed something, she called Abdulkader and asked him to bring it home. You can’t give in to fear, Abdulkader often told her. Her husband had said something else, too: There are good and bad people everywhere. That man in the ER knew only what he heard on TV about Muslims. He doesn’t know us. She looked outside at the pretty autumn day. Come on, she called to the girls in Arabic. She took them by the hand and started walking, determined, down the hill, from their quiet neighborhood toward the busy shopping complex. The detergent aisle at Stop & Shop was dizzying, a visual assault. Asmaa pulled a jug from the shelf, and carried the heavy bottle all the way home before she realized she had purchased bleach by accident. Down the hill they went again. By the time Abdulkader got home, the laundry was clean. Quietly, proudly, she told him what she had done. It was late September, Yom Kippur — the holiest day in the Jewish calendar. Asmaa and Abdulkader and their children sat in the front rows with the other Syrian families. 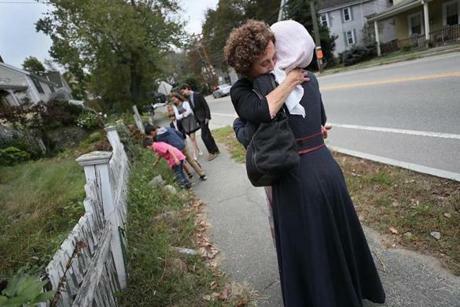 Bonnie Rosenberg, temple member and volunteer, paused to hug Asmaa Hayani on Yom Kippur. The rabbi had invited them here, to Temple Beth Elohim in Wellesley, to receive a blessing and meet their benefactors. Asmaa and Abdulkader could not have imagined such a thing, or even conceived of it, nine months earlier. In their first days in this new country, they had been shocked and afraid when they learned that many of the people helping them were Jewish. They lay awake at night, trying to reconcile what they had been taught — what they had thought of as truth — with the love and generosity they saw. They had been raised to believe that Jews were their enemies. They had learned that a man from this temple, Ed Shapiro, had fought to bring Syrian refugees to Boston. He had partnered with a Jewish resettlement agency, JFS, to convince the State Department, and then people from this temple and others had gone to work. They were the people who met them at the airport and made them a home — Jessica and all the rest, who had waited in lines with them and walked their boys to the bus stop and played endless games of peekaboo to make their daughters laugh. 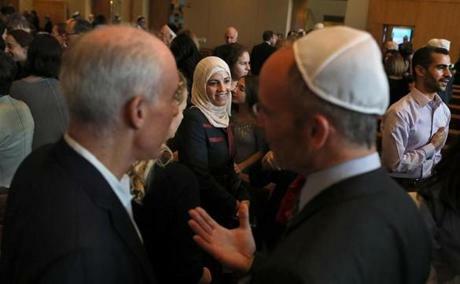 They listened now to the rabbi’s history lesson, an Arabic interpreter translating his words. “Because of that experience, for 3,000 years, it has been important to us to welcome people,” he said. He called for all the volunteers and all the Syrian families to step up on the bimah, the podium that holds the Torah, for the blessing. They crowded close together, shoulder to shoulder, looking out at 800 upturned faces. The rabbi asked God to grant them health and peace. Asmaa smiled as she walked down from the bimah at Temple Beth Elohim on Yom Kippur, surrounded by her Jewish friends. Outside the sanctuary’s glass walls, it was stormy, trees whipping in the wind. Inside, on the bimah, some volunteers were crying. When the service ended, the Syrians were besieged. Crowds of congregants pressed in around them, blocking the aisles, waiting for a chance to greet them. Asmaa felt someone take her hand, and looked down startled; a man was holding it, his face full of kindness. This touch from a man was haram, forbidden. Then another hand was on her arm, and another. Nearby, Abdulkader was also surrounded with men and women patting his shoulders and taking his hand. This new life, this new country, demanded so many things of them they had never imagined, compromises, tiny steps and giant leaps into the unknown. It was terrifying, disorienting, and thrilling at times, to wrench themselves from their own past, agonizing over what fragments to hang onto, without knowing where they were going or who they would be when they got there. Now, in the crush of warm smiles and embraces, they surrendered without pause to what the moment called for. When the service ended at the temple, congregants pressed in around Asmaa and Abdulkader, waiting for a chance to meet them. “I hope that you will pardon me,” he said in Arabic. “And that you will pardon me,” she answered.